Our range industrial crane scale for use in areas classified as hazardous (Zone 1 and 21, 2 and 22) in accordance with Ex II 2GD IIC T4 T197°C X protection. The structure is built completely in stainless steel, with IP68 protection, various weighing capacities are available. 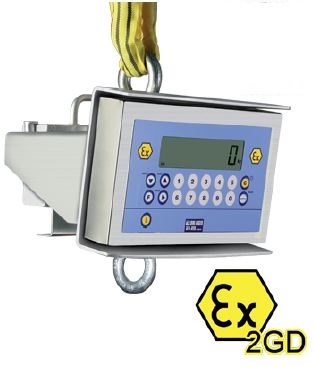 The weight is displayed on an LCD 25 mm display which gives the atex crane scale upto 160 hours use, to recharge the battery this is carried out in the safe area, additional battery packs can be supplied if required. LCD display with 6 25­mm high contrast digits and icons for showing the active functions. Built extremely sturdy in IP68 stainless steel. Hermetically sealed extractable rechargeable battery, with 160­hour operating time; rechargeable in safe area.